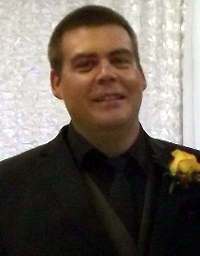 On Saturday, April 13, 2019, Blair Fletcher of Treherne, Manitoba passed away at the age of 41 years. He leaves to mourn his best friend and partner Lorraine Ackroyd, her daughter Haley Ackroyd and grandson Lincoln Ackroyd; his mother Patricia Fletcher; his siblings, Dale (Tamara) Fletcher and Erin (William) Topozzini and nephew Liam Fletcher. Blair also leaves to mourn Lorraine’s family, her mother Janet Ackroyd (nee Conn); her sister Karen Ackroyd (Ian MacDonald), her brother-in-law Bob (Celia) Friesen; her nieces and nephews, Amanda (Carson) McIntyre and Jaden Ackroyd; her great-nieces and nephews, Jaymyn, Cohen, Kade and Evangeline. Blair was predeceased by Lorraine’s father Bill Ackroyd; her sister Eileen Friesen; and by her great nephew Ayden McIntyre. Funeral services will be held at Adam’s Funeral Home on Friday, April 26, 2019 at 2 p.m.